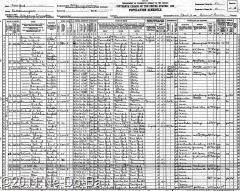 U.S. Census, Allegany, Cattaraugus Co., NY, page 11A, dated 10-Apr-1930. Lee O. Nette, head, owns her home valued at $9000, does not own a radio set, female, Indian, age 62, single, she can speak English and read & write, she and both parents born in NY, she is currently working as a Medical Physician. Nothing new here, but it is interesting to see she is listed as “Indian” in this census. The value of her home is considerably more than most of those on this same census page.